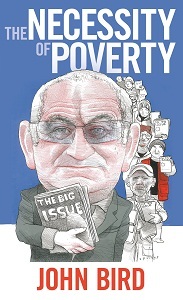 In the two decades since he founded The Big Issue, John Bird has become a major voice on social and political issues. In an exclusive piece for Ceasefire, he articulates the overriding theme of his new book, The Necessity of Poverty, and argues radical change means moving beyond protest, and toward a new collectivism. Last weekend I received the first printed copies of my short book, The Necessity of Poverty, and read it through while sitting on the grand classical esplanade in the front of the Fitzwilliam Museum in Cambridge. Occasionally, I looked up from the pages and had a sense of my place in history. That is the problem with us barrack room lawyers and autodidacts: we think we are so important that any little coincidental event is turned into a sign of great portentousness. What I hoped to do with this book was to begin the process of peeling back the veneer of radicalism that covers much contemporary political engagement. To expose what we need to do, which is move beyond protest. To find a new collectivism, one which isn’t based on marching in ranks and shouting at coppers and TV cameras. One which engages our time and attention in actually understanding the beast of capitalism. Poverty has often been seen, or put, or understood, as an aberrant piece of collateral damage wrought by an otherwise buoyant marketplace that all of us feed off and work in. Therefore it is seen as a bit of wobble in the system, and if we can only get Labour or Tory, Republican or Democrat, governments to look at it closely they will come up with policies that will ameliorate, or even eradicate much of its downside. Nice try! Say I. The nasty reality is that we all need poverty to keep our costs down. Poverty is the backbone of contemporary capitalism, as it was in earlier versions of its form. Not only do we want cheap Apples, and cheap apples, we try desperately to square that circle by a minority of us buying into “Fair Trade”. Supermarkets splash Fair Trade endorsements over their frontages when only a tiny percent of their product will have been sourced this way. So the appearance belies the reality. It is this false reality that I have set out to puncture. Take for instance the gap between rich and poor that many of us are concerned about. By the sound of it you would have thought that self-appointed one percenters raided our banks and wallets overnight to build up an enormous gap between themselves and the poorest. Most one percenters become one percenters because we, the consumer, choose to buy their product. Richard Branson, Bill Gates, Philip Green, Jamie Oliver; wherever you look you will see that enormous gap between rich and poor growing because we patronise these wealthy traders. We are the power house in the making of fortunes that put colossal resources in the hands of a relative few, while at the same time, see others without even the means to sustain themselves. The one percenters keep costs down for us, to our delight, by wielding the big stick over the labour market. That is why you will rarely find a billionaire praising the power of trade unions. The one percenters want to find their own ways of making their products cheaper so they can grow into behemoths. And that means weakening workers’ bargaining power. That means inviting us all into the conspiracy, each one of us helping the one percenters to keep their costs down by buying their products and services. We can chastise and rail against them. But we live in such a finely honed system (I describe it as a ‘mother-fuckingly’ water tight system) that much of this turns to steam. We rail at them but what we need to do is change our buying patterns. For when we buy the products of the one percenters we in fact vote for them and their system. However bad it tastes in the mouth. (By the way I don’t leave myself and my family out of this exploitative equation. I do not want to “define myself by the failure of others”, as so many people seem to do. I am up to my earlobes in this system and to change it I need to practise what I preach). I advocate the creation of new distribution outlets run collectively; in the same way that in the 19th century workers banded together to form mass purchasing arms in the cooperative movement. So let’s “redistribute the distributors”, for that is where the power and wealth is to be had. Let us go for a diverse rather than a monopolised market place. Suffering from a life long illness called “Delusions of Grandeur” (Dementia Praecox) I have woven my humble criminal underclass life into the book. I use anecdotes from my own life to back up my argument: if we want to turn poverty on its head we have to involve the poor themselves in their own redemption. I enjoyed reading my book in the exalted company of great pillars and blocks of stone put up to glorify the Fitzwilliam Museum. Did I achieve my ends? I leave you to decide. If you want a steer on it from me: it’s good in parts; which makes it a bit of a curate’s egg. But by hell we do need these kinds of discussions. We need to reinvent society real quick. I think the case put forth in this small book goes some way towards putting that idea before the public’s eye. Your job now is to buy dozens of copies as an antidote to a sugar-candied Christmas, and put them down neighbours’ and friends’ chimneys, to be enjoyed with a hot post prandial mince pie. And a resolve to bring dramatic change into our orbit in the year 2013. 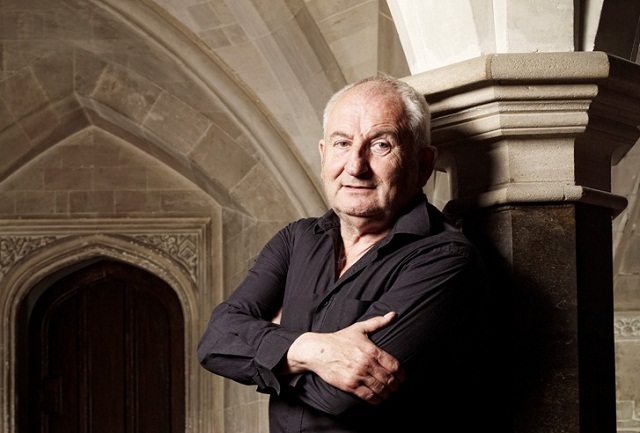 John Bird MBE is an internationally renowned social entrepreneur. He was brought up in an orphanage and served time in a young offenders’ institute in his teens. Having slept rough with London’s homeless, he decided to take action. He found factory work and soon became a skilled printer. Twenty-one years ago, John harnessed his knowledge of the print industry with his social vision and founded The Big Issue – sold by the homeless, for the homeless. As you know most of the communities (such as Bengali or Tamils) in the entire Indian sub-continent are covered by ‘Culture of Poverty (hopelessness)’ (Oscar Lewis), irrespective of class or economic strata, lives in pavement or apartment. Nobody genuinely condemn or ashamed of the deep-rooted corruption in this society, decaying general quality of life, worst Politico-governance, bad work place, weak mother language, continuous consumption of common social space (mental as well as physical, both). We are becoming fathers & mothers only by self-procreation, mindlessly & blindfold(supported by some lame excuses). Simply depriving their(the children) fundamental rights of a decent & caring society, fearless & dignified living. Simply pushing persons for a nasty survival. Do not ever look for any other positive alternative values to perform human way of parenthood, i.e. deliberately stop giving birth to any child him/herself till the society improves up to the mark, co-parenting children those are born out of extreme poverty, instead. All of us are driven only by the very animal instinct. If the Bengali people ever desires genuine freedom from vicious cycle of poverty, need to involve themselves in ‘Production of Space’(Henri Lefebvre), an intense attachment with the society at large to overcome inherent ‘hopeless’ mindset, decent Politics would certainly come up. – SB, 16/4, Girish Banerjee Lane, Howrah -711101, India.